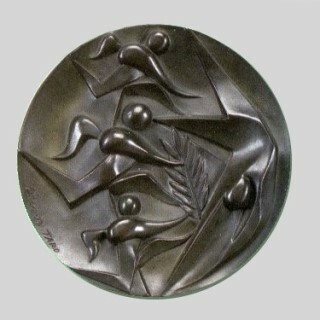 Stylized figures of three runners and swimmer. 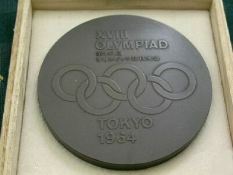 The face and the other side of these commemorative medals were designed by Messrs. Taro Okamoto and Kazumitsu Tanaka respctively. 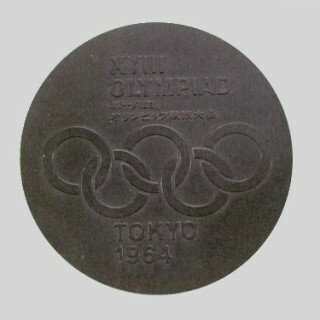 An athlete and a swimmer were placed on the leaves of olive on the face, while the other side carried the words of "XVIII OLYMPIAD TOKYO 1964" and an Olympic Mark. 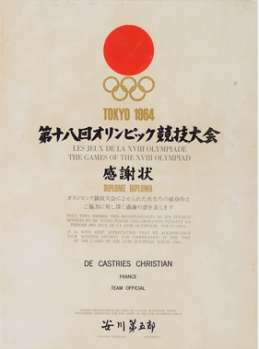 A total of 17,000 medals were issued to the participating athletes and officials. 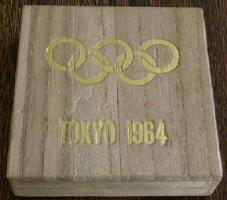 It was made of copper finished in dark green in a size of 60 mm in diameter with 3 - 5 mm thickness cased in a wooden box.